At Gates Ford, we know how important it is to keep your business moving. That's why we're bringing Ford Mobile Servicing direct to you, allowing maintenance and warranty work to be carried out right on your fleet's premises. So your vehicles can keep on moving. To make a booking please telephone 03300537088 or e-mail mobile@gates.co.uk. Q: What are the benefits of using Gates Mobile Servicing? A: By bringing Ford Mobile Servicing to you, work can be carried out on your premises reducing the amount of time your vehicles are off the road. 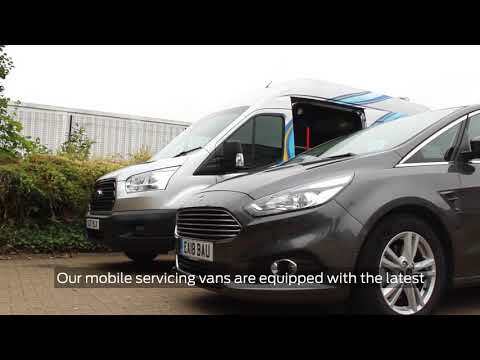 Our mobile servicing vans are fitted with Ford Diagnostic Computer Systems (IDS) for quick diagnosis and repair. What’s more, servicing, maintenance and repairs will be carried out by one of our Ford trained technicians. Q: Can you carry out warranty work? A: Yes, we can carry out small, manageable warranty repairs along with recalls/Field Service Actions (FSA) if applicable. Warranty repairs can only be carried out on Ford vehicles. A: Local businesses operating small or large fleets of vehicles can take advantage of this. By bringing Ford Mobile Servicing to you, fleet down-time is kept to a minimum. Q: Is Ford Mobile Servicing applicable to non-Ford vehicles? A: Yes, we are able to carry out routine servicing and maintenance work on all makes. Warranty work however, can only be carried out on Ford vehicles. A: Please contact one of our dedicated Ford Mobile Servicing representatives who will be able to arrange your booking at a time that suits the needs of you and your business. Please telephone 03300537088 or e-mail mobile@gates.co.uk. Alternatively, if you are an Epyx 1Link user, bookings can be made and authorisation gained from the 1link platform.